Buffalo plow service. Handling snow removal, plowing, salting, and maintenance. Providing quality snow removal, and plowing, services throughout Buffalo and Western New York since 2001! We are an experienced plow service with long term drivers who are timely, and efficient. One of our strenghts is our communication with our customers. If you have an issue, or request special attention, you can reach out and speak to someone right away. 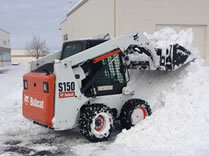 We offer a full range of commercial and residential snow management services and have been doing so throughout the Buffalo region for years. Contact us today for a free estimate snow removal and maintenance estimate. Our concentration is in the Buffalo suburbs of Lancaster, Depew, Cheektowaga, Clarence, and Williamsville. Call 716-444-3859 for your free snow removal estimate. Call today for a list of references regarding our Buffalo Plowing Services.